Published by Inspiro Software Sp. z o.o. Looking for fun games for when your bored? Play this cool game! Shoot your rockets to planets. Sounds easy? Try it. Planets are spinning circles or spinning wheels. They are rotating at a different speed. 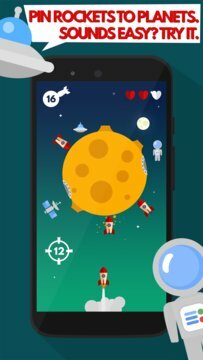 Pin rockets to planets and avoid obstacles what can be placed on the planet or fly around it. Test your reflex, concentration and shoot the wheel with maximum precision. Get used to acting under pressure. Make your decisions quick and set dot. Four galaxies and hundreds of planets are waiting for you to shoot rockets. Start your arcade space adventure now. Pin the circle and the dots and show how observant you are. 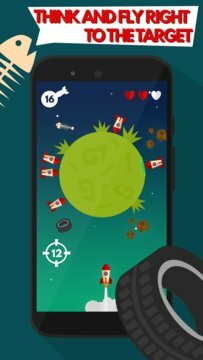 This cool rocket game will keep you hooked on for days. No wifi needed. Great time killer!